What's the difference between Deal Stage and Deal Status? Each Deal in MCA Suite has a stage and a status. 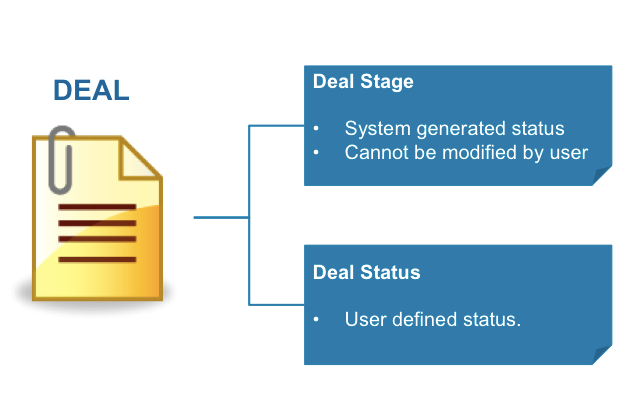 A Deal Stage is a system generated status that cannot be changed by MCA Suite administrators. MCA Suite users can define individual Deal Statuses associated with the Deal. Below is a screen of MCA Suite's Deal List page showing the usage of Stages and Statuses. Users can select a deal stage to view deals in the particular stage. Users can use the "Filter By" option to only view user defined deal statuses. Users can also use a combination of stages and filter by status to narrow down search/view criteria. New – When a new Deal has been created in the system. Users can also apply a Deal Status to signify where specifically the deal is in their operations. From a systems standpoint, MCA Suite will consider a Deal as “New” until it moves to the next stage. Active – A Deal automatically becomes “Active” when one or more deal notes are added to the Deal. For brokers, a deal is active when submissions exist. Funded – MCA Suite defines a Deal as “Funded” when Deal Tracking is turned on, i.e. when a user clicks the “Track Deal” button for a Deal. Brokers have the option to select various Submission Offers, which automatically turns on Deal Tracking for a Deal (selecting an offer is equal to funding a deal). So for Brokers, a Deal will also enter the “Funded” stage once a Submission Offer is selected. Paid – A stage where the funded Deal has an amount outstanding less than or equal to zero. This means the Deal was successfully repaid by the merchant. Declined – A stage manually initiated by a user. This stage will be used primarily by brokers when a lead goes cold. To set a Deal to the “Declined” Stage, simply click on the “Decline” button on the Deal Summary page. Defaulted – Another manually set stage. This stage should be set when the user determines that the merchant can no longer pay back the loan and that it is no longer possible to collect against the amount outstanding for that deal. 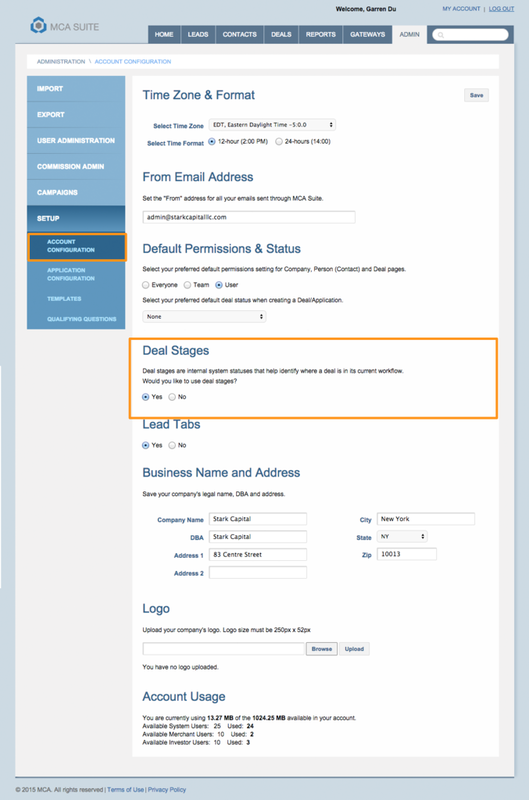 Users can go to the Deal Tracking page and click on the “default” button to push the Deal to the Default stage. Brokers only. When a submission has been created to at least one funder, the deal stage will become "Submitted". Has Offer – Brokers only. When an offer is received by a funder and entered into the system, the stage of the deal will become "Has Offer". Contract Out – Brokers only. A manually set stage when the Broker marks a submission forwarded to a merchant. Click the Contract Out button on the submission page. To modify Deal Statuses, refer to this FAQ article.